Dan Huet hit a hat-trick as East Preston sealed a crushing SCFL Premier Division triumph at struggling Eastbourne United on Saturday. East Preston put five past the same opposition in a FA Vase first round qualifying clash at The Lashmar last time out and were 7-1 victors at The Oval in this league encounter. Along with Huet’s treble, Ryan Quirke (two), Dave Beaney and substitute Cian Tilley all found the net. East Preston boss Bob Paine praised the performance from his troops. He said: “This was an excellent professional performance from the group and a thoroughly deserved three points. 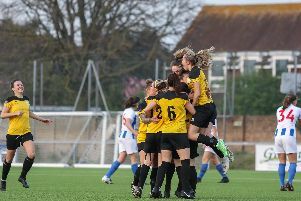 “We controlled the game from start to finish and although it is clear that Eastbourne United have a lot of problems, you can only play what is in front of you. Paine made five changes from the team that beat the same opposition 5-2 in the FA vase last time out. After several near misses, East Preston went ahead when Huet poked home from close range after eight minutes. It was all East Preston and Quirke fired home from the edge of the box to double the visitors’ lead four minutes later. The third came on the half-hour, this time defender Beaney’s deflected effort found the net. Eastbourne United showed more purpose after the restart, getting a goal back through Nicholas Cox on 52 minutes. Quirke got his second and East Preston’s fourth to restore their three-goal advantage 20 minutes from time. Paine’s team were not finished there though and Huet would go on to complete his hat-trick. Minutes after coming off the bench, Tilley kept his composure to fire past home goalkeeper Luke Colquhoun. Huet raced away two minutes later and with a tidy finish bagged his second of the afternoon. Frontman Huet completed his hat-trick a minute from time. The striker found space in the box after a Quirke corner, firing home from all of six yards to complete his first treble for the club.